Here is a inspiring collection of images by two architects turned photographers, Daniel Rueda and Anna Devis, who travel the world and capture interesting architecture while acting as subjects in their photographs. 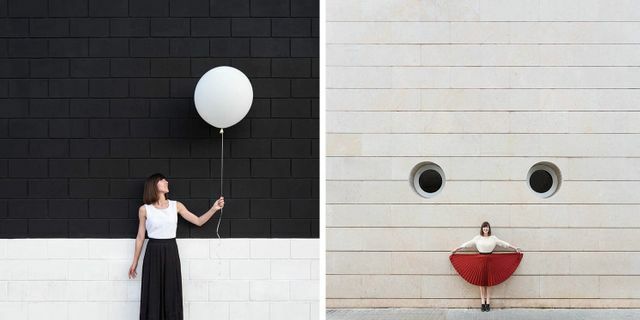 I love how playful but perfectly balanced, and almost soothing these photos are. Anna and Daniel have clearly become experts of working with shapes, scales and concepts. These “characters” serve to explain the scale of a space. The size of things would be higher or lower depending on the proportion it has with a human being. However, the role of these characters in my pictures is to tell a story that goes beyond aesthetics. That is, it is not enough to just have an image that looks more or less beautiful; it has to tell something without the need of putting it into words… While it is true that the texts that accompany the photographs are sometimes as important to me as the image itself.